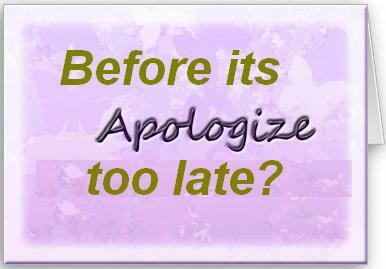 We heart our loved one and sometime we don't tend to say sorry verbally in such case a written apologize really helps. Most of the time people heart others by saying bad words, if you are in the same boat then don't worry, just write a letter to that person (Friends, Wife, Husband, Parents) or if possible you may want to leave a voice message instead, as this make better sense, I would prefer doing both sending an apology letter and a voice message. Following is simple apology letter which you can edit wherever require and send it. I am very sorry for how I spoke to you the other day. What I said was insensitive and hurtful. I was angry but still I have no right to take it out on you. You don’t deserve that kind of behavior from him. You have every right to be hurt and upset with ME, I would be if I were in your place. I promise I am working on controlling my outbursts when I get angry. We’ve been friends or in relationship for so long........., I can’t imagine going through life without you to share its ups and downs. I know you probably don’t trust me right now, but I will work very hard to regain that trust. Even though it may take a while before you do. I miss all the conversations we had. Note: If you got to know that you have heart someone than don't delay to apologize, sooner the better. I had written this letter to my crush in the year 2010. This is the best apologize letter I can think of, if you have similar experience writing an apologize letter, please do comment, we love to hear from you. Thank.